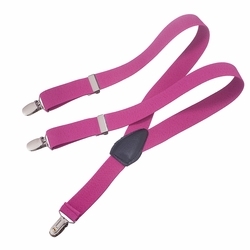 These Clips N Grips Kids Suspenders Fuschia suspenders attach to the pants and skirts with clips that are easy to open. These suspenders are quality and well-priced, durable, sturdy and practical. 100% polyester.